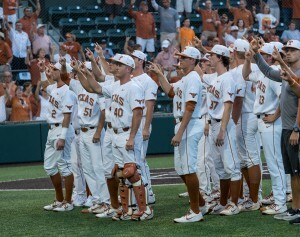 Texas is used to Omaha. Or is Omaha used to Texas? Either way, the Longhorns have played in 36 of the 69 College World Series held in Omaha, and won one of the three CWS held outside of Nebraska in 1949. 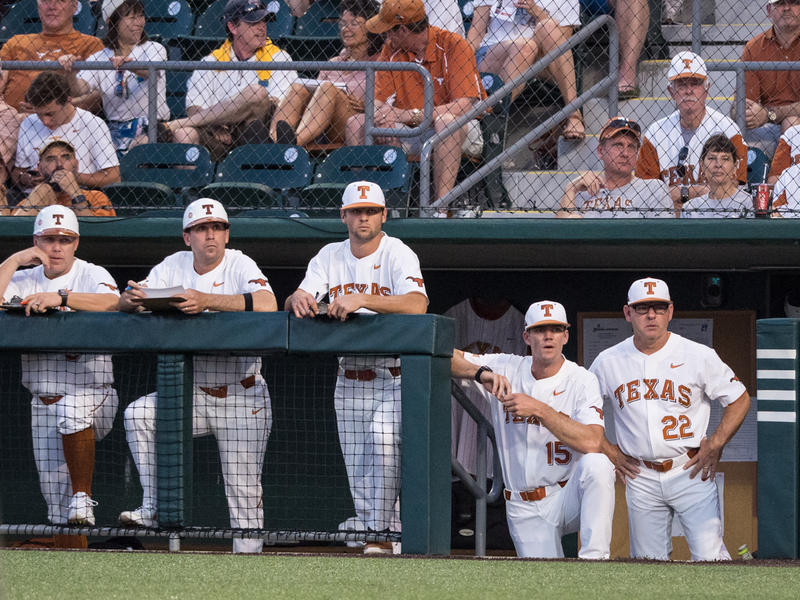 Most of the members of 2018’s Longhorns, however, aren’t used to Omaha. 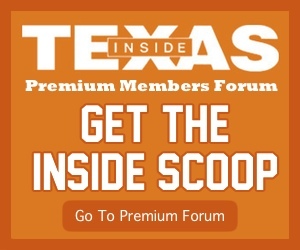 Though their defeat of Tennessee Tech in the super regional ensured every recruiting class signed by Augie Garrido at Texas reached the final eight, only redshirt junior Josh Sawyer has experience on college baseball’s biggest stage. Part of that lack of experience has to do with the failure to reach Omaha in the three previous seasons. The other factor is that half of the current roster wasn’t playing for Texas in 2017. 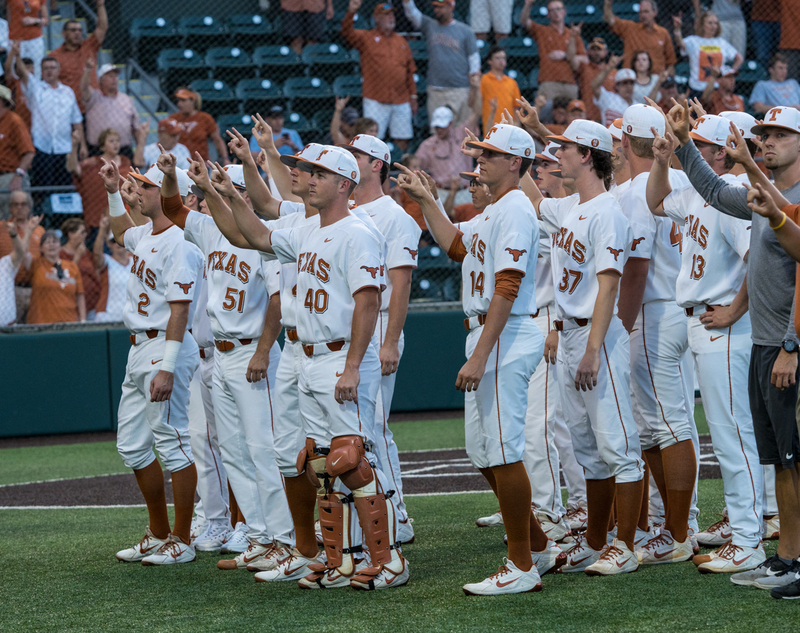 Texas head coach David Pierce’s masterful job of meshing his team together, finding what worked at the plate and on the mound, and placing Golden Spikes finalist Kody Clemens in the lineup every day are the main factors Texas is traveling back to where it expects to be. “This was the goal,” Clemens said. “This is where the University of Texas program should be, and we’re excited to get it back there. We’re going to have a lot of fun, and everyone’s excited. The job Pierce did allowed for an entire roster, save one pitcher who didn’t make an appearance in 2014, to make the first trip to Omaha of its career. That one pitcher remembers what 2014 was like and when asked by his teammates to describe the experience, he struggled to find an answer. Clemens talked to his brother, former Longhorn Kacy Clemens, to hearabout the College World Series. His sentiments were similar to Sawyer’s. “He just told me it’s the best experience, and he’s so proud of me and proud of this team,” Clemens said. 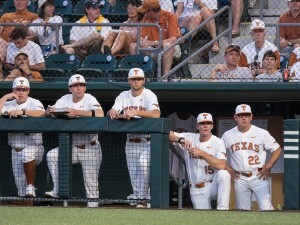 Until Sunday, Texas will be taking in everything associated with making half of the 72 College World Series played. On Sunday, they face an opponent they’ve previously met. Texas traveled to Arkansas in mid-March right after dropping 3-of-4 to an elite Stanford team. Facing another elite team, Texas dropped both games against the Razorbacks to drop to 9-9 on the year. The Longhorns experience in Fayetteville taught them just how intense the old Southwest Conference rivalry was. Though the Razorbacks won’t have the same home field advantage Baum Stadium provided, they’ll still be a difficult team to beat. However, the Razorback arms are what really stood out to Pierce. “I think that’s their strength more so than their offense,” he added. Though Texas dropped both games in March, most of the pitchers they used in that mid-week series likely won’t see action at TD Ameritrade Park, Omaha. Beau Ridgeway, Bryce Elder, Chris Fearon, Matt Whelan, and Jake McKenzie threw in game one of the series and allowed 13 runs. Nico O’Donnell, Bryce Verplank, Sawyer, McGuire, and Matteo Bocchi allowed seven runs in game two. The Razorbacks likely won’t see all but three of those pitchers: Sawyer, McGuire, or Bocchi. Despite the different hurlers they’ll face, Arkansas still has some of the best hitters in the country in its lineup. Heston Kjerstad, Carson Shaddy, and Casey Martin all hit north of .340 with double-digit home runs. There’s a small chance the Longhorns could face the first pitcher Arkansas used against them in Kacey Murphy. Murphy bounced between mid-week arm and weekend starter in the early stages of the season before solidifying himself as the second option late in Southeastern Conference play. If not Murphy, it will be ace Blaine Knight. Taken in the third round of the MLB Draft by the Orioles, Knight started 17 games in 2018 and posted a 12-0 record with a 2.84 ERA. If the choice is Kingham, Pierce made something akin to a prediction as he replaced the junior on in the first game of the super regional Saturday. Game 1 in Omaha begins at 1 p.m. Sunday.